Welcome to March's Winter Project Link Party! Before I get started sharing my progress on Hensfoot, I'd like to discuss a little link party business with you. I plan to host one more party, in April, to wrap up the series. I think it seems like a good place to stop, since it will officially be spring by then, and we might be looking to move on to more seasonal projects. I myself should be finished with my own winter project, Hensfoot, sometime soon, and I'll share a "reveal" post shortly. I have plenty of other things on the go, so there will certainly be something to share in April. I'm really glad to have done this series and if there is interest, I'll be happy to host again next winter! So, Hensfoot...she's almost there. I keep thinking maybe I'm done, then I add another row or two. It can't go on forever, though. Hensfoot is big, well over five feet long already and I haven't even added a border yet. That will give another couple or three inches on each side, I think, so it will be quite a large blanket when all is said and done. I'm still enjoying the work, but I have to admit that I'm ready to be finished now. Last month, I was feeling particularly bored with Hensfoot, so I started a cross-stitch project, the Retro Kitchen design I've shared a couple of times lately. It helped immensely to get a new project going. I felt like the change of pace gave me new inspiration to get Hensfoot finished up, and gave me something new and different to work on in between too. I'm usually quite reticent to have more than one project at once, but sometimes it's just a good idea. It's a funny thing about the yarn consumption with this project; it seems like it's using up a lot of yarn, but at the same time, it doesn't feel that way at all. Weird. I'm still hand-rolling balls as each color dwindles; I have just one messy little cake left in the basket, that beige yarn at about three o'clock, under the pale lilac and cream balls. There's still a fair amount of yarn here; I may have to make a small throw or a pillow or two. Sheesh...it's like a magic trick - the never-ending yarn basket! Could there be a white rabbit underneath? How about you? Please join in and share a post about your winter projects. It doesn't have to be winter where you are, just share what you're working on right now. Please read the rules carefully and take some time to visit other blogs and offer encouragement and support. Join us in April for the final link party of this winter season! 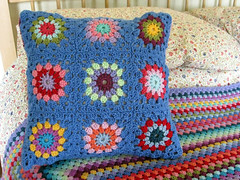 You have done so well, the blanket looks amazing and such vibrant colours so lovely to look at. I can only imagine its softness and comfort snuggling underneath. A prefect winter project. It's really lovely and now that you're nearing the end, it will give you that final spurt to complete it. Looking forward to the final reveal. I love the colours in your blanket. I have not had a good crafting winter this year. (Last year I made a double quilt, taught myself to crochet and made a cot-sized crochet blanket and resumed knitting after a gap of about 30 years. Fortunately my current projects are deliberately slow-burn with no deadlines. I'm patiently waiting for my concentration levels to return to normal before I start sewing together my 42 log cabin blocks. They are trimmed and ready but I'm not. Next year, there's always next year. I love this blanket, and I think it's wonderful that it is going to be big - perfect for snuggling! Hi Jennifer! Hensfoot is looking very nice these days. I can't imagine how big it will be with the border, so I'm curious to see it when you have it all finished. I love the idea of a Winter Link party again next year. Maybe I'll take part in it more than I did this year. It seems all I'm working on his mittens these days and I know people are probably bored with those. I know what you mean about the never ending your in basket. The odds and ends for my mittens skeins are the same way, they just keep piling up. Have a lovely weekend. Your blanket is looking terrific, thank you so much for hosting this party Jennifer, you are the best. I'm sorry I've missed so many of the link party posts this winter, Jennifer. 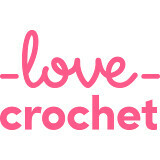 Life has been more frenetic than I expected and to be honest I've been running away from Blogland and kind of hiding in my yarn. I'm still making things, just not the particular thing I wanted to make for your winter party - so will link up to my most recent yarny post instead. Hope you're all doing well and looking forward to spring! Or has it already arrived there? Your Hensfoot Blanket has definitely grown. I can see it's nearly finished and that's exciting. I'm also hoping to finish my blanket in the next few weeks and I'm already thinking of projects for next winter. Your hensfoot blanket is very lovely. How wonderful that you are almost finished. I will be working on my blanket past the end of the winter link party. I'm just happy to have made progress on mine. 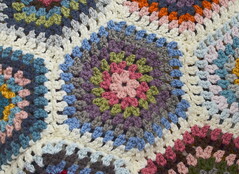 Your blanket is looking so lovely...the colours are very harmonious together. Hensfoot is looking great, I can't believe how big its got. Still a fair amount of yarn left in that basket though, definitely enough for matching cushions? Thank for hosting, Jennifer.